How Are Court Budget Cuts Affecting Trial Dates? Too Soon to Tell. It is too soon to tell if California civil trials will become an endangered species, as many have predicted, due to court budget cuts. After the governor announced yet another round of cuts for California courts, a San Francisco Superior Court judge told me civil trials will take five years to get to trial — the statutory maximum delay — because criminal cases take precedence. In my own recent experience, a civil case set for trial April 16, 2012 in S.F. Superior was continued for five months because there were no courtrooms available that week. That’s not all that unusual for the San Francisco civil courts, even before the cuts. One recent change is the elimination of court reporters for most courtrooms in San Francisco, Alameda, Los Angeles and many other counties. Lawyers now need to arrange for their own court reporters. We have been meeting with our San Francisco Superior Court as it continues to respond and adapt to reduced resources and staffing. One of the messages we have heard from the Court is a concern that many litigants with trial dates are appearing on the day of trial unprepared to go forward, presumably because they have expected (erroneously) that no courtroom would be available due to budget cuts. . . . Accordingly, we hope you will spread the message widely that, at least for now, trial dates are holding and the Court expects (and the system needs) parties to be prepared for trial or to seek relief from trial dates sufficiently in advance of trial. There you have it. Trials are still getting courtrooms — at least sometimes and at least for now. As I’ve often said, don’t assume your case is not going to start as scheduled. It’s a variant of Murphy’s Law. If you’re not ready for trial call, you are sure to be assigned a courtroom. Woman (as it starts to rain): Why don’t you open your umbrella? Man: It won’t help. It’s full of holes and leaky. Woman: Then why did you bring it? Man: I didn’t think it was going to rain. 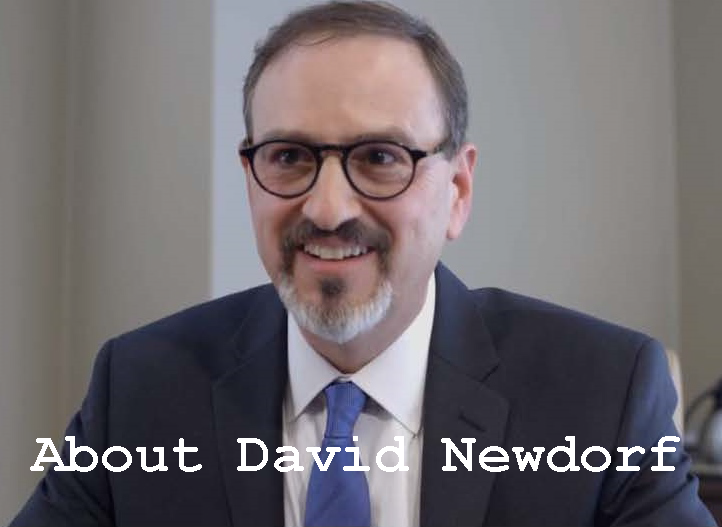 David Newdorf is managing attorney of Newdorf Legal, which represents individuals, businesses and public entities in trials and appeals. The firm’s practice areas include business disputes, business torts/interference with contract, breach of contract, breach of fiduciary duty, fraud, investment disputes, real estate, commercial landlord-tenant cases, and municipal law. Mr. Newdorf worked previously as a trial lawyer and team leader in the San Francisco City Attorney’s Office and was a litigation associate at a major international law firm. Mr. Newdorf was recently listed, for the second year in a row, in Northern California Super Lawyers magazine, an honor reserved for 5 percent of the State’s lawyers based on nomination by fellow lawyers and evaluation of professional reputation and achievement. 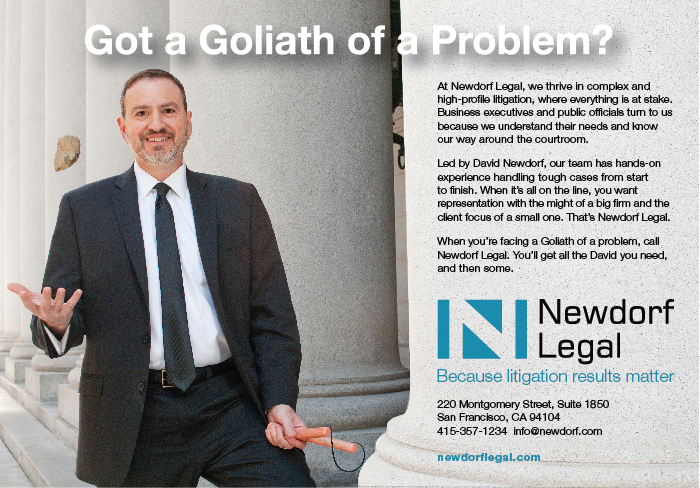 In a more unusual accolade, Mr. Newdorf was named “Badass lawyer of the week” by The Recorder’s blog, LegalPad. 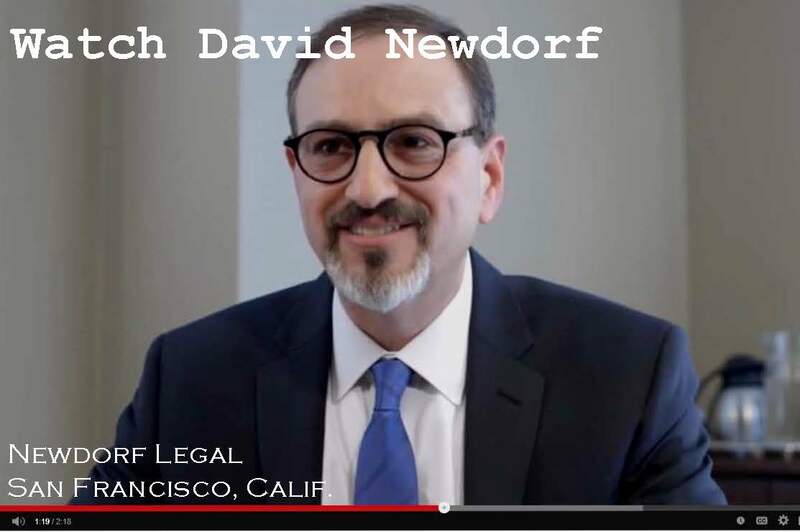 For all of your litigation questions, contact Newdorf Legal, a San Francisco business litigation law firm. The star of one of my favorite trial stories isn’t a lawyer. The star of this story is my wife, Shoey Sindel, a Berkeley wedding and portrait photographer. She was seated on a jury in a personal injury case. The case was tough for plaintiff, who admitted to being drunk and jaywalking when a motorist hit him on a dark street at night. Liability wasn’t the only tough sell. Damages were iffy because plaintiff had been unemployed for several years. Plaintiff’s counsel played the sympathy card, hoping that a showing of pain and suffering would sway the jury. When the plaintiff took the stand, he walked tentatively, leaning on a cane. He grimaced with each step. Either the plaintiff was in a lot of pain or he was a good actor. The next morning, as my wife was driving to the courthouse, who do you suppose she saw running across the street, jaywalking and holding a cane like he was going to hand it off in an Olympic relay race? That’s right. The plaintiff. Plaintiff did not appear to be in pain or suffering from any injuries. Shoey sat through the morning testimony until a break. She pondered what to do. Wait until jury deliberations and tell the jury what she saw? She expected that would lead to a swift verdict against this shifty plaintiff. She decided to tell the bailiff she needed to talk to the judge. The judge along with the attorneys met with Shoey in chambers. Shoey told the judge what she had seen that morning and that she couldn’t be an impartial juror. That was true. Shoey had become the star witness for the defense. Defendant would be entitled to call her as a witness to impeach plaintiff’s claims of pain, suffering and injury. The judge had no alternative. He declared a mistrial. The matter settled, and Shoey never had to testify as to what she saw. There is an important lesson here for lawyers and their clients during jury trials. The jury is scrutinizing you at all times, not just when you are on the stand or at the lectern. Late to court? Don’t cut off that car in the parking lot or cut to the head of the line at the courthouse entrance. That’s right — the jurors are watching. Taking a break in the hall? Not the best place to share a joke and laugh with your client. Mirth may not convey the message you would choose as to the seriousness of the trial proceedings. Sitting at counsel’s table when the other side’s witness has just delivered a surprise zinger? Now’s not the time to jump up straight in your chair, start scribbling notes furiously or lean over to whisper to each other with an agitated expression. Such a sudden burst of activity is the best way to signal the jury to pay attention to damaging testimony. Best reaction? A yawn. Trials are long and boring. At any one time, most jurors are drifting or daydreaming. No need to break the reverie when you’d rather they kept snoozing. Prepare your clients and witnesses as to courtroom etiquette before trial. They are to conduct themselves politely and with proper decorum from the time they get near the courthouse until the they have left the neighborhood at the end of the day. You can’t speak with jurors, but you can be polite. Hold the elevator or door. Let the juror go first. The jawywalking plaintiff with his phony injuries is an extreme example. Most lapses of decorum won’t lead to a mistrial. Just remember — the jurors are watching.